The Government of Canada has committed to get handguns and assault rifles off our streets. In support of this, the Minister of Border Security and Organized Crime Reduction was charged with developing additional policy, regulations or legislation that could reduce crime involving the use of firearms and keep Canadians safe. In particular, Minister Blair was tasked with leading the examination of a ban on handguns and assault weapons, while not impeding the lawful use of firearms by Canadians. The Prime Minister has publicly committed to examining all options relating to a handgun ban. In Canada, aspects of the firearms regime are regulated by different levels of government. The federal, provincial, and municipal governments all have responsibilities in ensuring the safety of Canadians with respect to firearms. Prohibited (e.g., small and prescribed handguns and fully automatic firearms). Individuals may own firearms in the non-restricted and restricted classes if they have the appropriate licence (which, in turn, requires successful completion of the appropriate safety course, background verifications, and other components). Individuals may only own prohibited firearms in exceptional circumstances outlined in the Firearms Act. The vast majority of owners of handguns and of other firearms in Canada lawfully abide by requirements, and most gun crimes are not committed with legally-owned firearms. Handguns fall into the restricted class or into the prohibited class when, for example, they are small and easily concealable; therefore, it is currently permissible for Canadians with the appropriate licences to possess certain handguns. Recent estimates indicate that there are about 900,000 handguns registered to individuals in Canada. In most cases, individuals own handguns either in the context of sport shooting activities or because those handguns form a part of a collection. Because assault weapon is not a legally-defined term, providing a count of how many are held in Canada is not possible. However, there are about 100,000 legally-owned restricted and prohibited non-handgun firearms – usually rifles and shotguns – registered to individuals. Some of these could have features consistent with what is described as an assault weapon. The number of non-restricted firearms with such features is not known. Individuals own these in the context of sport shooting activities, because they form a part of a collection, or for hunting. In Canada, there are also limits on the number of cartridgesFootnote 3 a firearm magazine can hold – ten for semi-automatic handguns and five for other centre-fireFootnote 4 semi-automatic firearms. Magazines of a larger capacity are prohibited. The below information is general in nature and should not be considered guidance relating to laws and regulations. For specifics, please consult the Canadian Firearms Program. Ownership. Certain types of handguns – such as those small enough to be easily concealed – are prohibited in Canada, meaning they can only be owned in exceptional circumstances. To legally own a restricted or prohibited handgun, individuals must hold a Possession and Acquisition Licence with restricted or prohibited privileges. Obtaining a licence requires the successful completion of the appropriate safety course, a background check, and other components. Registration. All restricted and prohibited handguns in Canada are required to be registered with the Registrar of Firearms. This is distinct from non-restricted firearms; there is no longer a national registry of non-restricted firearms in Canada. Storing, transporting and carrying handguns. Generally, handguns can only be stored in an approved location and according to regulations – unloaded, locked, in a secure case / gun safe, and separate from ammunition. They can also only be transported to those locations for which the owner has an Authorization to Transport, and regulations outline how they must be transported. In practice, these restrictions mean individuals cannot carry a handgun on their person or bring it to a non-authorized location. It is only under exceptional circumstances, such as in connection with an individual's lawful occupation, that individuals may be granted authorization to carry a handgun on their person. Gun violence is a serious concern. Data from Statistics Canada show that firearm-related violent crime has increased in recent years, despite the fact that the rate of violent crime, generally, has modestly decreased. In 2016, more than half (60%) of firearm-related violent crimes involved handguns. Statistics Canada has also concluded that much of the increase in firearm-related violent crime in recent years has been driven by increases in violent crime where a handgun was present. Patterns in this area can vary geographically. For example, handguns represent more than double the proportion of firearms seized by law enforcement in Montreal and Toronto compared to elsewhere in Canada. Just as there have been overall increases in gun violence, there have also been increases in the number of victims. About two-thirds of victims of gun violence are male; however, according to Statistics Canada, about 85% of the 694 victims of police-reported intimate partner violence incidents involving a firearm in 2016 were women. Also, the rate of firearm-related violent crime in Canada is nearly twice as high in the north as it is in the south, and Indigenous persons are the victims of homicides involving firearms at a much higher rate (13.5%) than would be expected given their representation within the Canadian population. Many handguns and other firearms used in gun violence are illicit and entered the market via theft from law-abiding individuals or businesses, straw purchasing (i.e., the legal purchase of a handgun or other firearm by a licenced individual who then diverts the firearm to the illicit market) or smuggling. Given these handguns and other firearms are not in the legal market and their number and characteristics are therefore hidden, comprehensive data on the relative proportion from each source is not available. Moreover, even when these are seized by law enforcement, it is not always possible to determine their original source. However, recently, a number of law enforcement agencies have indicated that they perceive that the relative proportion of illicit firearms from domestic sources, as opposed to from smuggling, has been growing. Any ban of handguns or assault weapons would primarily affect legal firearms owners, while the illicit market would be indirectly affected as there would be fewer available to potentially divert. Thefts from legal owners represent a growing source of illegally-acquired domestic handguns and other firearms. Statistics Canada reports a 70% increase in break and enters to steal a firearm between 2010 and 2017 (from 673 to 1,175 incidents), with greater increases in the Western provinces. Information is not available regarding whether thefts were from individuals or businesses. There may be cases in which thefts are related to improper storage or transportation of firearms. Exact data in this area is not available. Regulations for individuals storing handguns and other firearms include requiring that these be unloaded, stored separately from ammunition (with some exceptions), and that restricted and prohibited handguns and other firearms be stored in a container, receptacle or room that is kept securely locked and cannot readily be broken into, or stored in a locked vault, safe, or room specifically intended for this purpose. Separate regulations exist for the storage of handguns and other firearms by businesses. These include requiring that firearms be unloaded, stored in a locked cabinet, vault, safe, or location, or in an area only accessible to staff, that there be an electronic burglar alarm and that all points of entry, including windows, can be securely locked. When businesses are displaying handguns and other firearms, additional requirements are in place, such as having the firearm affixed to a wall or similar fixture via chain or cable. There are also legislative requirements and regulations relating to transportation which contribute to public safety and reduced opportunities for theft. These include obligations that handguns and other firearms be unloaded and transported in a securely locked container and/or compartment when the vehicle is unattended. The specific requirements vary depending on the class of firearm. Transporting handguns – as well as other restricted or prohibited firearms – (e.g., to a shooting range) requires authorization. Individuals involved in straw purchasing may be: individuals who purchase handguns or other firearms legally for illegal resale to anyone willing to pay, or individuals who knowingly purchase on behalf of others who do not have a licence. There are examples of significant volumes of firearms being involved in straw purchase schemes, with, for instance, 200 firearms seized from a single straw purchaser in 2014. Though the proportion of illicit handguns and other firearms in Canada that are domestically sourced is reported to be increasing, smuggling – typically from the US – continues to be an issue in specific regions of Canada (e.g. Southern Ontario and the Pacific Coast). The Canada Border Services Agency plays an active role in preventing them from being introduced illegally to Canada at the border, and, in 2017-18, seized 751 handguns and other firearms. Jurisdictions differ in their approaches to controlling handguns and assault weapons. For example, Australia and the UK have both enacted bans that limit or prohibit handguns. Federally, the US enacted a federal ban on assault weapons, but this ban expired in 2004 and no federal legislation to renew or replace the ban has since been enacted. In all cases the data does not conclusively demonstrate that these handgun or assault weapon bans have led to reductions in gun violence, though some studies drew other conclusions. The variation in study results reflects the fact that patterns of gun violence are influenced by many factors and the impact cannot be attributed to one factor. Some other jurisdictions have focused on approaches other than those discussed above – including, amnesties and buy-backs allowing those in possession of illicit handguns or other firearms to turn them in without criminal liability, and sometimes for compensation; stricter controls on the sale and/or storage of ammunition; handgun and other firearm markings regimes; and, educational campaigns. 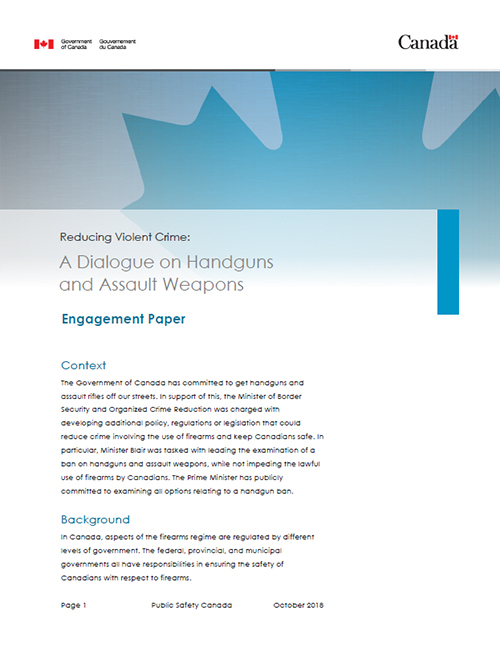 Other strategies for reducing gun violence that have been identified in Canada and other countries include requirements for flagging of large and unusual purchases – that is, implementing systems that would facilitate the identification of purchase patterns that may be indicative of straw purchasing – and reporting obligations relating to mental health of those who own firearms. In the latter case, it is important to recognize that there is a large body of evidence that in a general sense, mental health diagnoses are not associated with increased risk of violence. It is only in very few cases that mental health challenges reflect greater likelihood of harm to self or to others. A magazine is a device or container from which ammunition is fed into the firing chamber of a firearm. US Department of Justice, Public Safety and Recreational Firearms Use Protection Act (known as the Federal Assault Weapon Ban), enacted in 1994 and expired in 2004. A cartridge contains a projectile designed to be discharged from a firearm (for example, a shot shell). A centre-fire cartridge is one where the primer is located in the centre of the cartridge case head.